The Lord Mahavira Civil Hospital here wore a deserted look as laboratory technicians, pharmacists and PCMS doctors went on strike, leaving patients high and dry. Although patients from far-flung areas kept visiting the Civil Hospital for getting themselves checked at OPDs, they had to return disappointed. Lovi Kalyan, president of the Staff Nurses Union, said, "All are on strike today except staff nurses. We are catering to the indoor patients." It was also observed that most of the male and female wards, which usually witness a huge rush of patients, today saw a fewer number of patients. Many people who wanted to get their tests done criticised the striking employees for their callous attitude. Ramanuj, who had come from Old Sabzi Mandi to get his blood test done, said, "I have come here for my blood test, as I have been suffering from fever for more than a week. But there is none to collect the sample." Dr Balwinder Kumar, district general secretary, PCMS Association, Ludhiana, said, "All OPDs are closed, but emergency services, medico-legal cases and postmortem are operational." The strike also affected the newly appointed employees of different departments. Suresh Kumar, brother of a newly appointed employee of the state government, said, "We came here yesterday also for getting the medical examination done for job purpose, but could not as doctors were on strike. Today again, we faced the same problem." Another employee said, "The government should fulfil their demands, so that people like us are not harassed." Celebrations turned sour for District Youth Akali Dal president Simranjit Bains, who was busy greeting his supporters after a local daily and television channel claimed that their party had decided to give his brother a ticket from Ludhiana (south constituency), when a relative broke the news of his father-in-law's killing. A pall of gloom descended on the house of the Bains in Shimlapuri. Soon the Bains family left for the house of Sohan Singh Lambardar, located in Noorpur Bet. Simranjit Bains consoled the family members and cooperated with the investigation process. He further visited the Civil Hospital, where the autopsy of Sohan Singh was conducted. Soon a number of politicians also visited the hospital and expressed their grief. "I came to know about the incident in the morning. The robbers killed my father-in-law and fled with Rs 1.5 lakh, gold ornaments worth lakhs of rupees and one double-barrel gun," said Bains, while sharing the details about the incident at the hospital. After the postmortem, the body was taken back to Noorpur Bet village, where a large number of residents and relatives visited the deceased’s family to express their condolences. The victim leaves behind two daughters and one of them is married to Bains. The local police swooped down on a gang of 11 robbers, who had assembled to split their booty at Ladpur village, and arrested eight of them. Following a tip-off, a team led by SHO Kashmir Singh and CIA inspector Bikramjeet Singh Barar arrested the gang members in a joint raid. Three members, however, escaped the scene. Addressing mediapersons here today, SSP Ranbir Singh Khattra said Jasbir Singh, alias Jassi, Paramjeet Singh, alias Sonu, Balraj Singh, alias Babbu and Sonu, residents of Khanna, Rajiv Kumar, alias Sanjay, a resident of Payal, Vishwanath, alias Mangi, Raju Muneem and Surjit Singh, residents of Mandi Gobindgarh, Gurjeet Singh, alias Jeet, a residents of Mullanpur (Sirhind), Jagtar Singh, alias Teenu, and Gurpreet Singh, alias Ghugi, both residents of Kaulgarh, had got together at the village on December 22 when the police team raided their hideout and arrested eight of them. Sonu, Gurpreet Singh and Raju Muneem, however, fled the scene. The police has registered a case under Sections 399, 402, 411, 412, 473 and 120 B of the IPC and Sections 25, 54, 59 of the Arms Act against them. The police has recovered three pistols with four cartridges, four motor cycles, a Maruti car, one gold ring, one gold “karra”, Rs 1.4 lakh in cash, two iron rods and a baseball bat. The accused were wanted in different cases of robbery. It has been over six months since the city police resolved to take stringent steps to ensure a smooth ride for schoolchildren and proposed to float a helpline to keep reckless driving by school bus drivers in check. But the proposal of then Commissioner of Police Ishwar Singh has yet to see the light of day. According to the plan, the city police was to paste a helpline number on the back of school buses and auto-rickshaws ferrying schoolchildren. Residents could use the helpline number to register their complaints if they found a school van, a bus or an auto-rickshaw ferrying children exceeding the permissible speed limit. It was also planned that a police squad would visit a school once a month to check the norms followed by the school bus drivers. A police official said the helpline numbers would generate a sense of fear and accountability in drivers’ mind and they would drive carefully. In the past when the police had taken stern action against the erring drivers, the school bus operators went on mass strike, resulting in chaos and mismanagement. What successive governments could not do for residents of this nondescript village of Ludhiana district during the past decades was accomplished by a team of Singaporean volunteers in less than three weeks. Besides spending Rs 11 lakh, 25 volunteers of the Young Sikhs Association, Singapore, worked day and night to provide a completely new look to the premises of the Government Middle School, which had since been running in an old building. Besides getting roofs of five rooms reconstructed and the building painted, the Singaporeans transformed an old rundown room into full-fledged library, donating 3,500 books on various subjects. All 191 students of the schools are jubilant as they now have attractive bags, books and stationery, in no way inferior to students of any public school of the area. Though teachers led by Hari Dev had politely refused to accept any present from them, the volunteers made sure to present gifts to them too. The villagers, with an intent to pay gratitude to the philanthropists, organised a thanksgiving function on the school premises on Thursday and students presented a cultural programme in their honour. Satwant Singh, a member of the committee running the affairs of the association, said the programme was part of “Project Khwaish XI”, YSAS’s community service mission to Punjab. “Once we return to our country, we will like to commend the team members for their selfless contribution to making a difference to the lives of children in the village by providing them with a positive educational environment, which we take for granted in Singapore,” said Satwant Singh after the conclusion of the function. Christmas was celebrated in schools across the city with fervour and enthusiasm. Stressing the importance of Christmas and highlighting the message of love and sacrifice, students enacted a play at Ryan International School. Carol singing, rock band, Christmas rap and other colourful performances filled the air with jubilation. The students visited the Mother Teresa and Mercy Home orphanages and lent a helping hand to the inmates. They distributed gifts, sweets, cakes, etc. among the children. The school for special children celebrated the festival with gaiety and fervour. The students came dressed as Santa Claus. They sang carols and danced on Christmas carols. Students born in December had a date with Jesus Christ as they celebrated their birthday along with that of Jesus Christ. An X-mas tree was decorated with stars, bells, balls, fairies, etc. and the children danced around it singing “Jingle bells”. Students sang Christmas carols, songs and prayers. A church scene was also depicted by the students. Some students came dressed as Santa Claus, father and nuns. Students of the junior wing tapped on the tunes of carols and distributed candies. Students depicted Christ’s birth and sang carols to mark the celebrations. They were dressed like fairies, Christ, Mother Mary and Santa Claus. A student dressed as Santa Clause distributed sweets and cake among children. A magic show was also organised. Children decorated their classes with posters, models of Santa Claus, bells and reindeer. They also decorated a Christmas tree with gifts and bells. They later sang carols and received gifts from Santa Claus. A choreography based on Jesus Christ’s birth and blessings by angels filled the air with joy. The model of Christ’s birthplace was recreated on stage, depicting Mother Mary and the holy child. A Santa Claus distributed candies and gifts among students. Teachers led from the front by giving performances using props, as children enjoyed different games. The teachers were dressed as angels, Santa Claus, etc. Children received gifts from Santa Claus. A New Year’s cake was cut and snacks were served to students. They danced on carols to celebrate Christmas and welcome the New Year ahead. The cultural bonanza comprised song and dance performances, a fancy dress competition and recreation of the scene of Jesus Christ’s birth. The programme ended with a song sung by a choir to extend season’s greetings. Creative activities like card making, cherries out of stockings and bell making were also organised. Children came dressed as angels and fairies and danced on carols. Students also presented a play and walked on stage as Santa Claus. Sweets were distributed among them. The students later visited an orphanage and brought a smile to the faces of the inmates. Cookies, pastries, cakes and sweets were distributed among children to mark the celebrations. A dance was presented by tiny tots. The students sang “Jingle bell”, “We wish you a Merry Christmas and a Happy New Year”. The school premises was bedecked with lights and X-mas trees. A Santa Claus distributed sweets and chocolates amongst students. The children sang Christmas carols. The five-day workshop on “Research methodology, applied statistics and use of SPSS”, which started on December 18 at BCM College of Education, concluded here today. Both staff members and students participated in the workshop. Mahesh Munjal, managing director, Majestic Auto Ltd, presided over the concluding day function. Principal Dr Khushvinder Kumar welcomed the chief guest and the resource person for the workshop. A report on the workshop was read out. A students’ representative from MEd and a representative from the faculty presented their reflections on the workshop. Munjal said there was a need to invest more in the field of research to get best results. He expressed dissatisfaction over the budgetary allocation for research in India. The second day of the NSS camp at BCM College of Education started with a yoga camp by Satpal Sharma from Patangali Yogpeeth. NSS volunteers performed “asanas”. This was followed by a PT drill by Devinder Singh. He underlined the role of exercise in keeping good health. The volunteers were also briefed about the importance of mediation by Seema Chopra from GHG Harparkash College of Education, Sidhwan Khurd. This was followed by PowerPoint presentation and wall magazine article competitions on health, public sanitation and personal hygiene. Doraha: As part of the ongoing NSS camp for girls and boys of Guru Nanak National College, Doraha, 22nd Liaison Officer, NSS, Punjab Government, Charanjit Singh paid a special visit to the college. He explained the significance of youth activities, especially of the National Service Scheme, to the volunteers. Sanjay Sharma, branch manager, LIC of India, shared the role of the LIC in providing job opportunities to youth and the trust it had won over a period of time. Also, Usha Chopra, first aid trainer from Red Cross Society, Ludhiana, imparted knowledge about administering first-aid in accident and poisoning cases. She gave practical training to volunteers about different types of bandages and artificial respiration in cases of asphyxia. 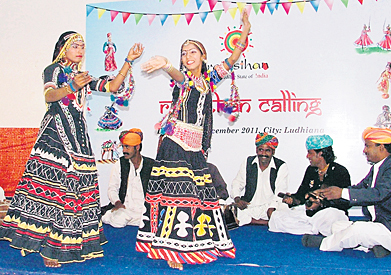 The three-day cultural extravaganza “Rajasthan Calling”, organised by the Department of Tourism, Government of Rajasthan, in its bid to attract domestic tourists from Punjab, opened at the Rotary Bhawan here today. The festival is to be held in 22 major cities across the country, including Gurgaon, Kochi, Madurai, Coimbatore, Dehra Dun, Rajkot, Mumbai, Vadodra, Surat, Kolkata, Ahmedabad, Ludhiana and Chandigarh. “The reason behind holding the festival in the industrial hub of Punjab is to give the city residents a feel of Rajasthan and facilitate a better understanding about the state. Another objective is to provide complete information and showcase the Rajasthan’s traditional culture and exquisite range of handicrafts and delicacies,” said NL Alawada, Deputy Director, Rajasthan Tourism. The major highlight of the festival will be live Rajasthani folk performance and traditional food court. The food court has stalls serving famous “dal baati choorma”, “kachori”, “mirchi bada” and traditional sweets. Folk music and dances presented on the occasion includes “langas”, “kalbelia” dance, “treatoli” and many more. “At least 20 stalls depicting varied handicrafts work from various regions of the state have been put up at the festival. These include woollen shawls from Bikaner, Namdas from Tonk, embroidery from Barmer, brass “nakkashi” and blue pottery from Jaipur, terracotta from Udaipur, tie and dye from Jaipur, Pali and Jodhpur and leather items like bags, “juttis” etc from Jodhpur and Barmer,” he added. According to Devinder Meena, assistant tourist officer, Rajasthan Tourism, with 13.78 lakh foreign tourists and 255 lakh domestic tourist arrivals in 2010, Rajasthan is easily one of the most sought after tourist destinations in India. The popularity of the state is primarily owing to its incredible tourism products - its rich heritage, its forts, palaces, lakes, colourful and lively fairs and festivals, golden sand dunes and wildlife with the added attraction of adventure sports, wellness tourism, handicrafts and shopping. Another big attraction, of course, are the world acclaimed heritage hotels, luxury trains - Palace on Wheels and Royal Rajasthan on Wheels, the most favored locales and landscapes for film shootings and world famous cities like Jaipur, Jaisalmer, Udaipur and Jodhpur. India’s most favoured tourist circuit - the Golden Triangle - also has the city of Jaipur in it. Rajasthan has also made a mark for its pilgrimage trail. Lecturers and principals awaiting promotions in government schools are in a fix, as uncertainty looms on around 4,000 teachers who are due to be promoted from master-cadre to lecturers, masters to headmasters and lecturers to principals. Although promotions have been sanctioned, the promotion lists are still being awaited by the teachers. No promotion orders have been received by schools so far and many teachers and lecturers are feeling frustrated. As the election code of conduct is set to be announced any time soon, once it comes into effect, all proceedings will be frozen midway and promotions will be held up until the elections are over. “We are feeling cheated. The education minister’s statement that promotions have been sanctioned has given us hope but the promotion lists are yet to be released. If the ruling alliance loses the elections, it is possible that the decision on promotions may be dismissed altogether and the entire procedure will be started all over again,” said a lecturer, who is due for promotion to principal. The proceedings are under way. It will take about a week to complete the formalities and depute lecturers at appropriate stations. I have nothing to say on matters concerning the election commission. Ivanna Institute of Fashion Technology and Hotel Management organised a blood donation camp in the memory of Col Gurbir Singh Sarna KC, who sacrificed his life fighting terrorists in Baramula, Jammu and Kashmir, in 2006, here today. The camp, which coincided the martyr’s fifth death anniversary, was organised to awaken the youth and remind them of their responsibilities towards the nation. Over 60 students of the institute and staff donated blood. Glodas — Gift of Life and Organ Donation Awareness Society had put up their stalls. They educated the donors and others present about the various human body organs that could be donated. Literature was distributed among those present. The camp was organised in association with the Red Cross Blood Bank of the city. The mid-day meal scheme being run in government schools has started pinching teachers as they have been forced to pay from their pockets to keep the scheme running. They are in a fix. They can neither stop serving the food nor refuse to paying for running the scheme. If they do so, they have to face the ire of officials of the education department. Teachers of Government Primary School, Chander Nagar, have spent Rs 40, 000 from their pockets on the scheme. And those from Government Primary School, Indrapuri, Tajpur road, and Government Primary, Subash Nagar, are yet repay more than Rs 35,000 for goods taken from shopkeepers. Other teachers from schools at Mundian Kalan, Chet Singh Nagar, Sunet village and Basti Jodhewal have been forced to spent Rs 53,000, Rs 30,000, Rs 30,000 and Rs 30,000, respectively, from their pockets. ‘If the government dose not have funds for running the mid-day meal scheme in the schools, then what the purpose behind serving meal,” asked a teacher? Thousands of students in government schools of the district are unsure of their future in the absence of guidance officers there. While some schools have teachers who double up as guidance officers, none has dedicated guidance counsellors or student psychologists to whom students can go individually when they face career dilemmas. Guidance corners have been created in some schools where students are informed about the entrance examinations and job openings. Navjot, studying in class XII at a government school in Ludhiana, faces the same predicament. Unsure of what he was good at, he chose the commerce stream as his friends opted for the same. He soon realised that accounts wasn’t his area of interest and should have gone in for the medical stream instead. But his family’s meagre means do not allow him to start afresh and is on the verge of quitting his studies altogether. “If someone had been there to counsel me in the beginning, I would have chosen my field accordingly. I have already spent years of savings on studies last year, and have no means to begin again,” he laments. “The need for students studying in government schools for career guidance and counselling is all the more great, as a majority of them have little chance to experiment or dabble in different careers and then make a U-turn,” says Sanjiv Thapar, principal, Government Model School, PAU. “What happens now is mass counselling, but an independent guidance counsellor should be deputed for individual counselling of students,” says to Santokh Singh Gill, district guidance counsellor, Ludhiana. “Student counselling is a specialised field, as new professions are emerging,” says Thapar. Also, no standardised psychometric tests have been conducted in government schools to know the students’ aptitude and abilities. “Ruchi” tests to know the students’ interests have been conducted though. Government employees feel discriminated against as they have fewer casual leaves than their women counterparts. According to the Civil Services rules, men can avail only 10 casual leaves in comparison with the women, who have the provision to avail 20. An employee can avail 15 leaves after serving 10 years in the government job. On the other hand, a woman employee can avail 20 casual leaves every year from the date of joining. Male employees, who are demanding more casual leaves from the government, have termed it as discrimination on the grounds of gender. “It is discrimination on the grounds of gender. Indian social structure demands more leaves for men then women. But, we want nothing more or less than our female counterparts,” said Gurbeer Singh Alamgeer. “First 10 years of employment is more crucial than the years that follow. We need more time for marriage, upbringing of children and social settlement than women. The government must make an amendment in the Civil Services rules. If not 20, the government should at least allow 15 leaves for us,” said Sarbjeet Singh, said a government middle school teacher. Christmas trees, bells, gifts and Santa Claus can be seen in every nook and cranny of the city. Hotels, restaurants and malls are gearing up for the Christmas celebrations. Residents, too, are looking forward to celebrate the festival in style. The lobby of a hotel on the Ferozepur road is decked up with a 30-foot Christmas tree and statues of reindeer and Santa Claus. A ginger-hut is all done up with loaves of bread pasted outside. Delectably done cakes, including plum cakes, Yule log and a variety of cookies have been arranged especially for the occasion. “Carols are being sung by the choir bands in the evening. A buffet of roasted turkey has also been organised,” said Umesh Yadav, food and beverage manager of the hotel. Special DJ Night will be organised in a restaurant of a mall on the Ferozepur road. A lady DJ is especially going to perform on the occasion. Only couples would be allowed to enter the performance area in the night. “This festival is becoming popular in the city and has become a harbinger of joy,” said Pavneet Kaur, who was found shopping for the Christmas at the mall. Although people seem to be spending less, but more and more people are taking part in Christmas and year-end festivities,” said Ramesh, who owns a shop in Ghumar Mandi. 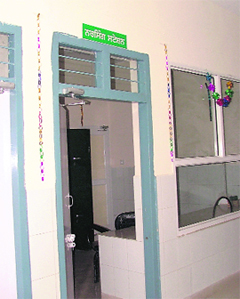 Although new appointments are being made in the health department, the newly constructed maternity ward of Lord Mahavira Civil Hospital has been without adequate staff. Dusty glazed tiles of the ward in addition to locked nurses and doctors’ rooms reflect the sorry state of affairs at the hospital, where maternity patients lie on newly placed beds but in the absence of proper cleanliness. Talking to The Tribune, Mehro Devi, a patient’s attendant, said: “There are enough beds here but no one comes here to clean the floor daily.” It was observed that even the sheets of some beds were stained with blood, etc. The district administration has in a direction issued to all officials told them to file a reply to all applications under the Right to Services ordinance by December 31 failing which strict action would be against the negligent officials on January 2, 2012. Additional Deputy Commissioner (Development), Pradeep Aggarwal, said it is mandatory for the officials to file a reply to all applications regarding 67 services under the ordinance. Not only action would be taken against the negligent officials, but a fine of Rs 250 per day would also be imposed on them for the delay, he added. He added that all monthly reports regarding the ordinance must be submitted to his office by 5th of every month.